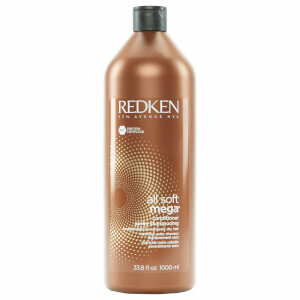 Treat brittle, dry hair prone to breakage with the Redken Soft Obsessed All Soft Duo. Now featuring an exclusive RCT Protein Complex, the pair of specially developed treatments work in tandem to intensively strengthen, soften and smooth, leaving locks with enhanced manageability and maximum shine. The shampoo cleans hair while imparting a silk-like texture with Redken’s Silk-Luxe Complex, featuring a unique combination of ingredients. Gold Camelina adds luminosity and lustre, Avocado Oil restores moisture and provides replenishment, Olive Oil intensely conditions and Silk Amino Acids counterbalance any loss of protein. 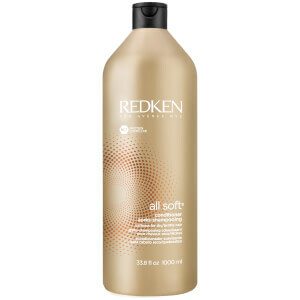 Add a finishing touch of pure silk with the All Soft Conditioner, the perfect accompaniment. The complex formula smoothes and detangles, minimising frizz and leaving you with sleek, healthy looking hair. Formulated with Silk-Luxe Complex and an exclusive Interbond Conditioning System renews texture and strength to leave your locks beautifully sleek and with a brilliant shine. Shampoo: Apply to wet hair, massage into a lather, rinse. In case of contact with eyes, rinse them immediately. Conditioner: After shampooing, apply and distribute through hair. Rinse. In case of contact with eyes, rinse them immediately. Shampoo: Aqua/Water, Sodium Laureth Sulfate,Dimethicone, Disodium Cocoamphodiacetate, Glycol Distearate, Hexyleneglycol, Sodium Chloride, Cocamide Mipa, Parfum/Fragrance, Sodium Pca,Salicylic Acid, Benzoic Acid, Guar Hydroxypropyltrimonium Chloride,Carbomer, Citric Acid, Propylene Glycol, Sodium Citrate, Disodium Edta,Sodium Cocoyl Amino Acids, Potassium Dimethicone Peg-7 Panthenylphosphate, Sodium Sarcosinate, Benzyl Alcohol, Argania Spinosakernel Oil, Arginine, Hydrolyzed Soy Protein, Coumarin, Linalool,Limonene, Fumaric Acid, Hydrolyzed Vegetable Protein Pg-Propylsilanetriol, Ci 15510/Orange 4, Phenoxyethanol, Ci 17200/Red 33,All Soft Tetrasodium Edta, Potassium Sorbate, Sodium Hydroxide (D184464/1). Conditioner: Aqua/Water, Cetearyl Alcohol, Behentrimonium Chloride,Elaeis Guineensis Oil/Palm Oil, Cetyl Alcohol, Isopropyl Alcohol, Phenoxyethanol,Stearamidopropyl Dimethylamine, Octyldodecanol, Sodium Pca, Parfum/Fragrance,Citric Acid, Sodium Cocoyl Amino Acids, Chlorhexidinedihydrochloride, Stearyl Alcohol, Myristyl Alcohol,Potassium Dimethicone Peg-7 Panthenyl Phosphate,Sodium Sarcosinate, Propylene Glycol, Argania Spinosakernel Oil, Arginine, Hydrolyzed Soy Protein, Hydrolyzedvegetable Protein Pg-Propyl Silanetriol, Sodium Chloride,Tetrasodium Edta, Potassium Sorbate (D184537/1).